Movement Handles included. Plain textures included to match the G8F Vest Top plus some patterned ones. Thanks so much, love the skirt and the fact that the Vest Top matches!! The movement handles are such a plus! You're the BEST! thank you again for all your generosity! Thank you very much for this lovely skirt! 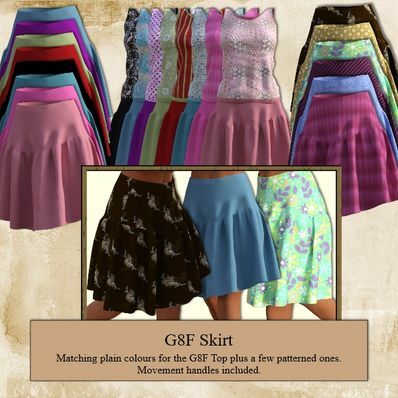 Thanks so much Wendy for your generosity of creating & sharing these pretty skirts for G8Fs. Superbes ces jupes, bravo !